inLombok is one of Lombok's largest union operated and worked travel organization. We serve you to travel flexibly, effectively, and efficiently. We accompany you to any destination you want and wish, or we will recommend you the most beautiful places you must see. We serve all of your needs from flight bookings, hotels, resorts, itinerary, meetings, tour guide, couple tour, group tour, company tour, business tour, car rental, motorcycle rental, airport pickup, and more. We also serve you who speak Arabic. So, welcome. 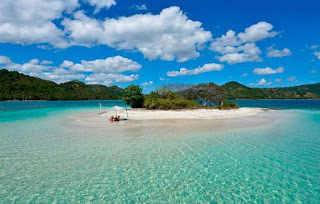 Lombok is an island in the province of West Nusa Tenggara, Indonesia. It forms part of the chain of the Lesser Sunda Islands, with the Lombok Strait separating it from Bali to the west and the Alas Strait between it and Sumbawa to the east. It is roughly circular, with a "tail" (Sekotong Peninsula) to the southwest, about 70 km across and a total area of about 4,514 km² (1,825 sq mi). The provincial capital and largest city on the island is Mataram. It is somewhat similar in size and density with neighboring Bali and shares some cultural heritage, but is administratively part of Nusa Tenggara Barat along with sparsely populated Sumbawa. It is surrounded by a number of smaller islands locally called Gili.